K. Dakin Design is a landscape architectural practice headed by Karla Dakin focusing on plant-driven design of landscapes, food gardens and green roofs for private residences, museums and public spaces as well as commercial projects. Dakin specializes in ongoing, multifaceted projects that push our expectations of landscape and engage all five senses, creating places that are ecologically sound, playful and aesthetically resonant. K. Dakin Design recently won the CARE Award for Remodeling Excellence and was named as one of the Top 10 Mountain Landscape Designers by Mountain Living Magazine. 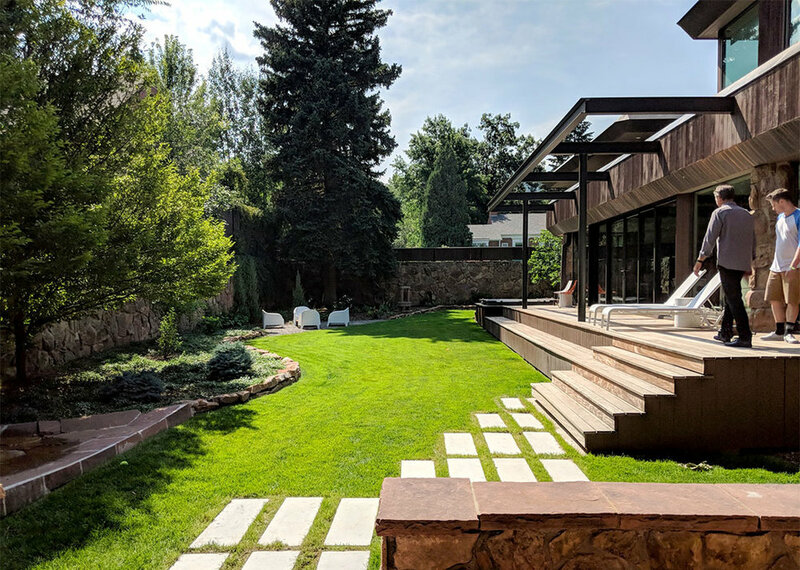 K. Dakin Design won the 2018 CARE award from the Custom Builder and Remodeler Council of Denver for the reimagination of the landscape around this classic organic-modernist home designed by Charles Haertling. The landscape design is inspired by the original home and it’s materials, especially the distinct, clean lines of the architecture and the natural, stone veneer found on the house and landscape walls. Welcome to Karla’s home and garden. An avid gardener as well as a landscape architect, Karla maintains her own space as an ongoing design inquiry. The garden contains perennial and annual food crops, trees, ground covers, flowers and ornamentals. Karla prioritizes native and climate-appropriate plants as well as pollinator host plants. She believes that one of the chief pleasures of cultivated landscapes is their harvest: fruits, vegetables and flowers. The multiple ecosystems present in this garden represent various exposures onsite: sun to shade, dry to wet. Her design creates space that bring pleasure year round: incorporating a crevice garden, a “creamsicle” garden, and a gravel garden with rotating sculptures centered around a 100-year old apple tree. After building her dream garden, Karla was able to extend her design principles into a small living space above her garage. She researched her favorite architects' own studios and homes, knowing that, like her, they would have the space and funding constraints that lead to ingenious design solutions. She was inspired by the home of Peter Zumthor, Augustus Saint-Gauden's studio in New Hampshire with its magnificent northern exposure and a museum in Yaounde, Cameroon. Local building codes dictated that she include a small deck, which gave her the opportunity to research and explore tropical & Mediterranean edibles like dwarf papayas, dwarf bananas, passionfruit, lemons and figs that stay outside in the summer and come inside in the winter.